"When a man goes to sea, he ought to give up thinking about things on shore. Land don't want him no more. I've had me share of things gone wrong, and all come from the land. Now I'm through with the land, and the land's through with me." John Ford's The Long Voyage Home is a melancholic look at life at sea. Based on four one-act plays by Eugene O'Neill, this is a compelling adaptation of the great playwright's work. Combining German Expressionism with gritty documentary-like visuals, Ford and screenwriter Dudley Nichols look deep into the soul of the crew aboard the merchant ship Glencairn. It isn't an easy film to endure, but the effort is well worth your while. The crew consists of various men from around the globe, laboring for a meager living that they'll most likely drink away in a single evening. Driscoll (Thomas Mitchell) is the charismatic, hard-drinking mate that loves to sing and dance almost as much as he loves to push and shout. The dejected Smitty (Ian Hunter) looks longingly towards a shoreline well out of sight, carrying an unbearable burden in silence. Yank (Ward Bond) and Cocky (Barry Fitzgerald) work with honor, while Donkeyman (Arthur Shields) reflects about the life of a seaman. Whether slaving to keep the ship afloat during a storm or relaxing in the Atlantic's sun, each man is wary of the current assignment. Seafaring through Europe's wartime waters, each man realizes that death could be lurking under the surface. Ford's film is a studied look at its characters, choosing to avoid clich�d plot developments in favor of a realistic look at life aboard a merchant ship. The driving force behind the events on screen is Ole Olsen (John Wayne). Ole is largely a solitary figure, speaking only in fragmented English. This is to be his final voyage at sea thanks to the guidance of Axel (John Qualen), who has helped Ole save his money to return home to Sweden and buy a farm. While the crewmembers may be preoccupied with their own desires, each man always rallies around Ole to help him return to a life they will never have. It is the bond, I think, that interests Ford. His movies look closely at the relationships between men, both positive and negative, to unlock their humanity. In The Long Voyage Home, Ford solemnly exams maritime life. His affinity for the sea is clear, as is his own disappointment of never being a sailor. Under Ford's direction, the audience is treated to a highly personal motion picture. There's much to admire in the film. Gregg Toland's rich black-and-white cinematography is gorgeous. The smog and dark alleys when the men arrive ashore in England are vividly captured, evoking an ominous tone while also treating the viewer to one startling shot after another. The scenes at sea are also well realized; take, for instance, a disturbing moment when the crew suspect one of their own to be a German spy. It results in a trial that is absolutely heartbreaking thanks to the beautifully simple dialogue and eloquent performances. Mitchell is astonishing as Driscoll. He crafts an indelible performance that sums up the movie's whole thematic content about loneliness and integrity. Wayne is also good, delivering an unconventional turn that proves his diversity as an actor. Ian Hunter is heart-rending as Smitty and Arthur Shields amiably serves as the film's sage. O'Neill declared The Long Voyage Home to be his favorite adaptation of his work. It is easy to see why he would say so, since Ford and Nichols weave his plays into a marvelous reflection not only on nautical life, but mankind's nature. As the Glencairn's crew sails through the Atlantic's dark waters, they represent their shore-bound counterparts. This isn't the most entertaining motion picture in the Wayne/Ford canon, but it is one of the most rewarding. Image Transfer Review: Gregg Toland's cinematography is some of the best work you'll ever see, with deeply textured blacks and stunning contrast. I'm happy to say that the image transfer does an exceptional job of bringing the black-and-white images to life on DVD. Depth is so strong you can practically get lost in all the fog, while the shadow detail is worthy of applause. There are some minor flaws in the image that likely stem from the source material's age. Nevertheless, I can't foresee the film looking any better. Audio Transfer Review: The original English monaural mix is preserved for this release, presenting a crisp and clean representation of the theatrical experience. Dialogue is always audible and the sound of the ocean roaring is surprisingly engaging. Nicely done! Extras Review: The sole supplement provided here is Serenity at Sea: John Ford and the Araner (13m:17s). This brief featurette quickly exams Ford's relationship with his 106-foot boat. Ford biographer Scott Eyman, as well as grandson Dan Ford and select others, provide interviews that play alongside home movie footage of the filmmaker aboard his boat. While quite brief, the featurette does present fascinating information about Ford's work habits on board the Araner, as well as the financial strains it placed on him. This is a fitting supplement to the discs feature. 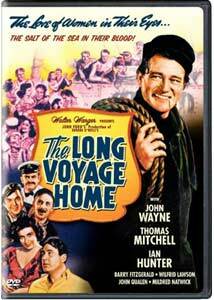 Available for the first time on DVD, The Long Voyage Home should make a pleasant arrival in any film buff's collection. The image and sound transfers bring the theatrical experience to life.